Vote three times in this week’s historic Cat Fight. Can Elvis win 2 out of 3 and take the title OR will he be defeated and sent back to the minors. The answer is in your hands. Listen to the Cat Fight Podcast and then vote THREE TIMES! Put on your dancin’ shoes for this week’s Friday Night Cat Fight Podcast over the classic rock n’ roll tune, “Do You Want To Dance.” This week, all six of the versions in competition made the pop charts. Of course, some did much better than others, but they all cracked the Hot 100. So I really think we have an even playing ground. 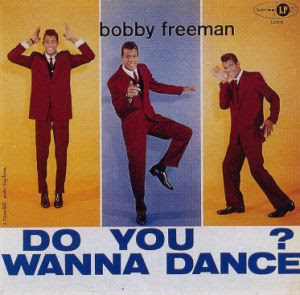 Bobby Freeman wrote the tune and scored its biggest hit to date with his 1958 original. The Beach Boys came close to Freeman chart-wise as did Bette Midler (the song that really launched her career). Del Shannon, The Mamas & The Papas and The Ramones all did their own unique versions of the tune, even if they didn’t chart as high. So listen to the podcast, dig the tunes and VOTE for the one you DIG THE MOST!